–Xmas in all its various permutations including 50 versions of “This Christmas” and “Go Tell It on the Mountain,” to be followed by Chinese food and a movie…. —Kwanzaa–yes I celebrate it and Love it! So let’s start with Hannukah. Hannukah is not the Jewish Christmas. It predates Christmas as a commemoration by a couple hundred years. Gift-giving as an element of Hannukah emerged fairly late in Jewish tradition and in North America its inextricably tied to the proximity of the holiday to Christmas. In Eastern Europe and Germany it was traditional for Jews to give a little “gelt,” or Yiddish for gold coins, to their children on Hannukah. Along the Mediterranean coast and the Middle East Jewish children were encouraged to give tzedakah (which means righteousness but in this case refers to charitable giving) on Hannukah and many received money on Purim or Passover. If you have ever wondered about those gold or silver foiled chocolate coins–they took the place of the real thing once Jews lived in countries with paper money. Hannukah has several traditional narratives. The first one, you may have heard of involves a revolt against the so-called Syrian-Greeks (Greek colonists and Greek influenced Middle Easterners who wanted everybody to follow Greek culture and civilization) and those Jews who really wanted to join them and those who wanted to remain true to Yehudah/Judea and her indigenous Monotheistic temple cult and cultural traditions and laws based around the observance of the Torah. A war, lasting several years ensued and a heroic figure Yehudah Maccabee emerged leading the Jewish people to victory against the Hellenists and Hellenizers. The holiday miracle passed down from generation to generation was that there was only one jar of consecrated oil and this oil should only have lasted one day, but lasted eight days. Hannukah may have also been an attempt to re-celebrate the holiday of Sukkot which also lasts 8 days (with the inclusion of another holiday called Shemini Atzeret). What do I serve on Hannukah? Well typically its usually a one day thing that I cook for and I pretty much make the rounds on all other days of the holiday. While I do like the traditional stuff–latkes-or potato pancakes (some of ya’ll might say hash browns LOL), with sour cream and dill or sour cream and green onions, and doughnuts–always a yum—deep frying is a cooking style particularly important and endemic to both the Middle East and Africa. It is of course, the cooking style–for good or for ill–that the Southern United States is best known for. Just in case you were wondering, traditionally African Jewish communities–the Beta Yisrael of Ethiopia, the Lemba of Southern Africa, and groups in West Africa, did not celebrate Hannukah. For the Beta Yisrael in particular because Hannukah was not a Biblical holiday they didn’t know of it! Now in Israel, many Jewish communities of African descent celebrate Hannukah with Jews from around the world. The Hannukiyah and the Kinara of Kwanzaa are similar in form but don’t have the same meaning. Hannukiyah’s are in the home because its called in Judaism the Mikdah Me’at–the little Temple. The original menorah was in the Holy Temple–and that menorah—with seven branches instead of nine, held the oil mentioned in the story of the miracle. The Kinara has seven distinct principles associated with it. Oh one more thing–Hannukah, Kwanzaa, this, that…all holidays are “made up,” by human beings for human beings. I have the feeling that Kwanzaa would be a lot more “official” to the wider world if market forces could benefit from it–but its not a holiday that’s meant to be commercialized. It is a holiday where African Americans and people of African descent who choose to celebrate it are supposed to keep money in their community (cooperative economics) and to overall avoid spending a lot of money on needless things and commercializing the observance… So for you Kwanzaa-naysayers, put that in your kinara and light it! What makes these latkes Southern to me is that they include a little bit of the “trinity”—in this case, garlic, green onion and celery with hot cayenne pepper. Wring the potato shreddings in a cheesecloth, and repeat several times to extract as much moisture as you can. In a medium bowl stir the ingredients together. In a large heavy-bottomed skillet over medium-high heat, heat the oil until hot. Most recipes call for between 350-375 degrees. 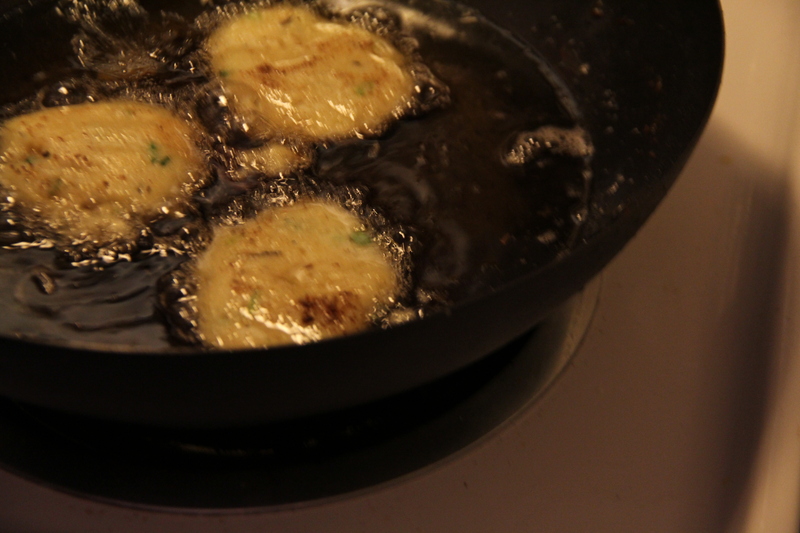 Place a heaping tablespoon and a half of the potato mixture into the hot oil, pressing down on them to form 1/4 to 1/2 inch thick patties. Brown on one side, turn and brown on the other. Let drain on paper towels. Serve hot with an extra dusting of hot pepper and a few slices of green onion. Dips: applesauce, sour cream, and maybe some sweet chili sauce (sugar, vinegar, salt, garlic, chili, pepper). So I am a newfound Chef Roble and company fan. Along with Welcome to Sweetie Pie’s on OWN, Bravo has high props from me for doing a show with a Black chef! A new Black chef! He did a whole kosher dinner for Matisyahu (somebody else I look up to)–and boy don’t I wish i could have been there LOL. His sister Jasmine and friends make up delicious cuisine and can make anything. Roble is of Somali heritage and he mentioned making and eating sambusa. The name sounded really familiar to me—they are called sambusak in much of the Middle East–like samosas they are a stuffed pastry—what you put in them changes from place to place. Some sambusak are vegetarian, others have meat, it all depends on where you are from. In some parts of the Jewish world, sambusak are made with ground meat and onions inside–very similar to how sambusa are made. My “recipe” is based on the excellent and authentic recipe on MySomaliFood.com. You can find the recipe at http://www.mysomalifood.com/appetizers/somali-sambusa/. I didn’t know what Somali food was until I went to this site! Lots of Horn of Africa meets Arabian peninsula meets Swahili coast meets India influences….meets sub-Saharan Africa. So this isn’t a standard recipe. Somwhere Diane Jacobs is shaking her finger at me…. Basics–I used spring roll wrappers because I didn’t want to make the sambusa wrappers from scratch–boo hoo–sue me–but I LOVE paper thin spring roll wrappers! Next time I will do triangles, I promise! Use the flour paste in the recipe to seal them. You can use ground beef, ground lamb, ground chicken, ground turkey or ground bison. I chose to go with beef, but next time its going to be bison. If using lean ground beef and bison, use a little more oil in the pan. I chose to saute the onion (1 finely chopped small red onion)and garlic (one minced clove) with a little oil in a pan then added the lean beef (one pound). I cooked until brown, adding in the spices—, 1 teaspoon of sea salt, 1 teaspoon of black pepper, 2 teaspoons of cumin powder, 2 teaspoons of coriander powder, 1 teaspooon of cardamom powder and a teaspoon of Madras curry powder. I added a small chopped green serrano chili, a few dashes of fish pepper sauce, a few tablespoons of chopped green pepper and a teaspoon or two of cilantro and flat leaf parsley mixed. I drained all of this on paper towels, tossing a couple of times. 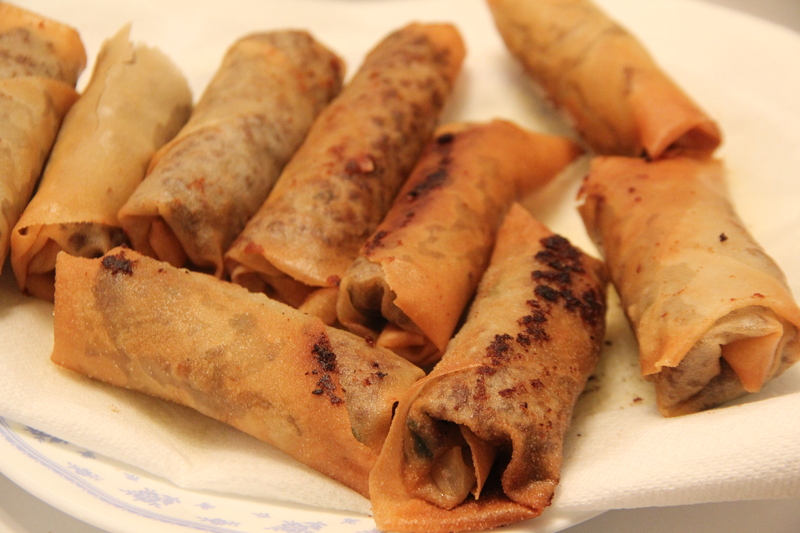 I filled each spring roll wrapper with the sambusa mix and sealed them, then fried them golden brown. Thanks for the latke recipe — the green onions and spice were fantastic. Now, give me a call for real, and let’s cook.